A screen is a dividing structure of two spaces. It is usually associated with bathroom screens although there are others that are also related as they are such as screens, office desks in the offices of the companies or the gates of the subway platform. But in this article we refer to shower screens as shower doors. 20 or 30 years ago, curtains were used for showers. Although it was very profitable for the time, it generated many difficulties to carry out a deep cleaning, because the lower zones end up being worn by the action of the water and the soap. With the arrival of the shower doors, it gave rise to a change in the way of designing bathrooms. And although the plastic curtains have not yet been used, sliding shower doors have proven to be better in style, space, elegance and innovation. - Bathroom doors can be built with different systems: sliding, folding and swinging. Regardless of the space we have, there will always be a solution. - These doors give our bathrooms an elegant and sophisticated touch, more when its design is in aluminum and the thickness of the glasses is marked. - We can choose the designs and stripes printed on the glasses. They are preferable those that are sober and functional, that is, those that only opaque part of the surface to increase the sensation of privacy. 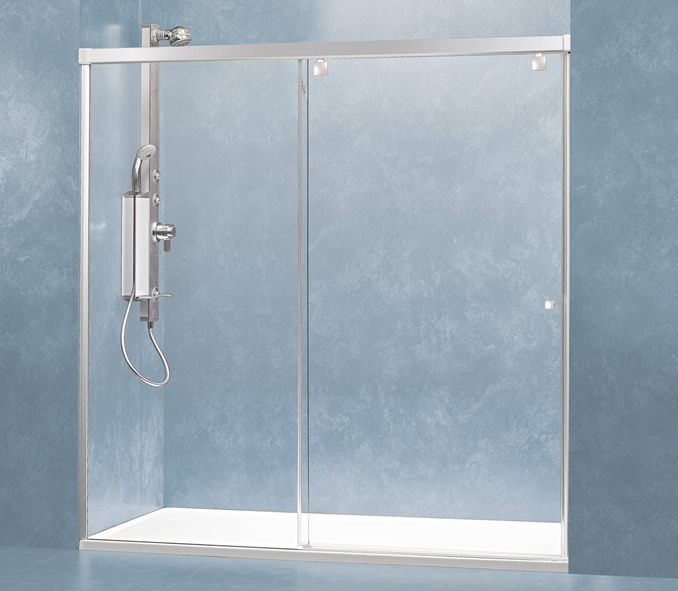 There are different shower doors each of which we have available in All Interiors New York, so that when decorating your bathroom have the option to choose the one you like, such as sliding shower doors; They are the most common and require minimum space, the folding ones; which prove to be very good choice when space is limited as they open to the accordion style while allowing a free access to the shower, swinging; is designed to give elegance to the showers, it can be constituted by one or two doors and many more that you will know when contacting us. Article created based on: Jluis en baño(2009), Ventajas de las puertas de ducha (n.d.).